Mövenpick Hotel is a relatively newcomer to the dining scene in Pattaya (or Na Jomtien to be more correct), out on Sukhumvit Road. To get there (which is actually the easiest part of the whole exercise), head towards Sattahip, do a U-Turn at Ocean Marina and Mövenpick is about 200 meters along on the left. A long driveway gets you to the secure parking area. There is an elevator which will then take you up to the Lobby where a staffer will take pity on you and guide you down again and to their Twist restaurant. All very confusing, the architect must have been on prohibited substances, or perhaps I have difficulties with spatial relationships. However, Twist restaurant is large, has big tables, comfortable seating and attentive staff. After our first course, I was ready to forgive the architect. A Café Gourmand afternoon delicacy. We had actually gone to Mövenpick to review their best combination of “bistro” and “gastronomy” called a “Bistronomie” food promotion, which runs to November 20, 2017. The “Bistronomie” concept was conceived in the 1990’s when young French chefs with haute cuisine training re-interpreted classical dishes and served them in a new breed of casual, less stuffy, “bistro”-style restaurants. This concept of ‘Bistro’ dining has proved itself to be a world-wide phenomenon, and the trend that started in France two decades ago has now become a global culinary movement. Faithful to this style of cuisine, the Mövenpick chefs have created seven exclusive “Bistronomie” dishes, all of them promising high quality French cuisine with a twist. The seven dishes on its new “Bistronomie” menu include “Salade Niçoise”, “Plateau de Fruits de Mer” (Seafood platter), “Moules Marinières” (Mussels with garlic and sweet cream butter), “Cabillaud à la Bordelaise” (Cod fillet), “Pot au Feu à la Bourgeoise” (Beef topside hot pot) and “Cordon-bleu au Comté” (Veal rump steak). What expands the menu is the fact that you can add, subtract or change ingredients. This is very much to an individual whim, which the chefs take in their stride. 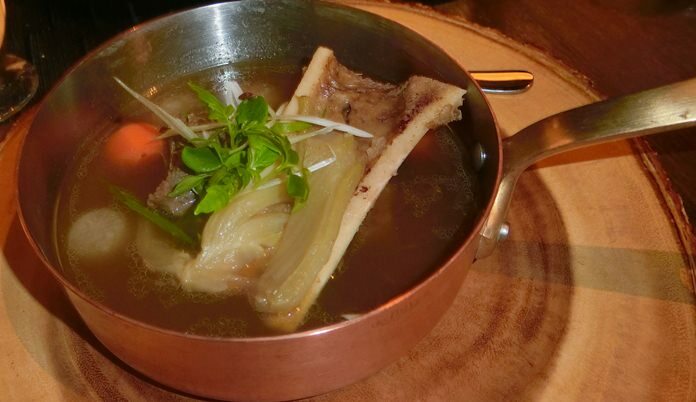 This includes vegetarian options such as “Pot au Feu Végétarien” (Vegetable hot pot) – for example. 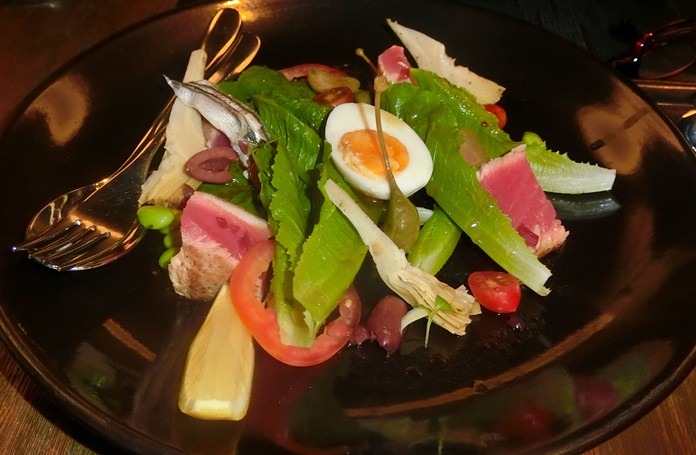 We began with a Salade Nicoise which had sashimi-grade tuna, artichoke heart, lettuce, cucumber, sardines, Kalamata olives, several condiments including paprika and thyme. A myriad of tastes and textures, and I loved it (B. 300), and it is not too often that I heap praise on a salad. The next taste sensation came courtesy of a seafood platter. No ordinary seafood platter either, with Fines de Claire oysters, a Greenland shrimp cocktail, mussels, salmon and scallops (B. 450 single and 850 for a couple). F&B Assistant Manager Issarachai then brought out a ‘pot au feu’ a style of hot pot with topside beef and beef marrow with horse radish and Dijon mustard. The chefs in Switzerland certainly knew how to elevate a simple hot pot to a gourmet dish. 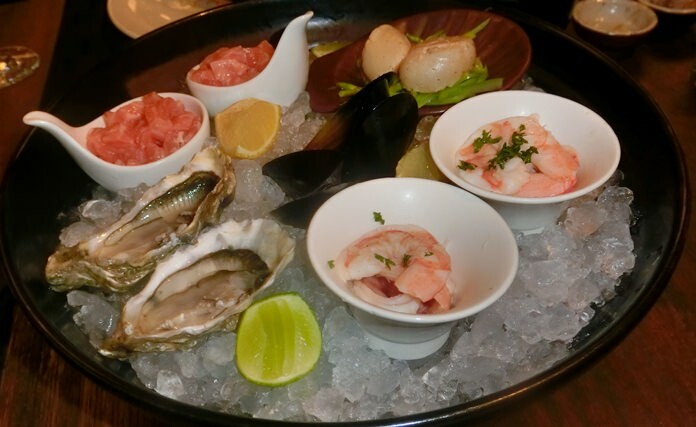 Seafood platter with Fines de Claire oysters. The next dish was my favorite, a sea bass fillet with herb crust, with potato mousseline and lobster bisque (B. 420). Very delicate with the soft white flesh parting under the fork. So to desserts which featured Mövenpick’s version of “Café Gourmand” – a French take on the British “afternoon tea”. 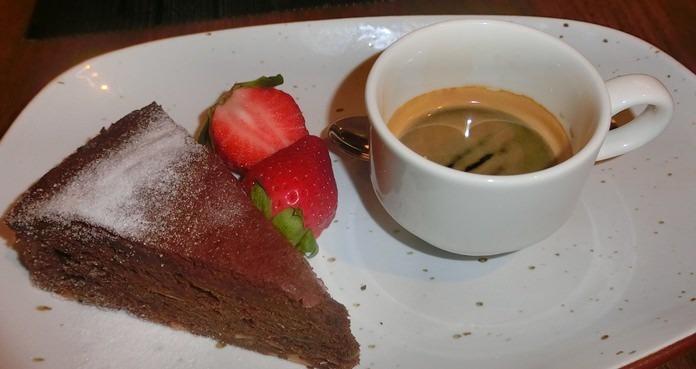 The “Bistronomie” “Café Gourmand” combines aromatic coffee with “Reine de Saba” (“Queen of Sheba”), combined to make an irresistible chocolate cake. 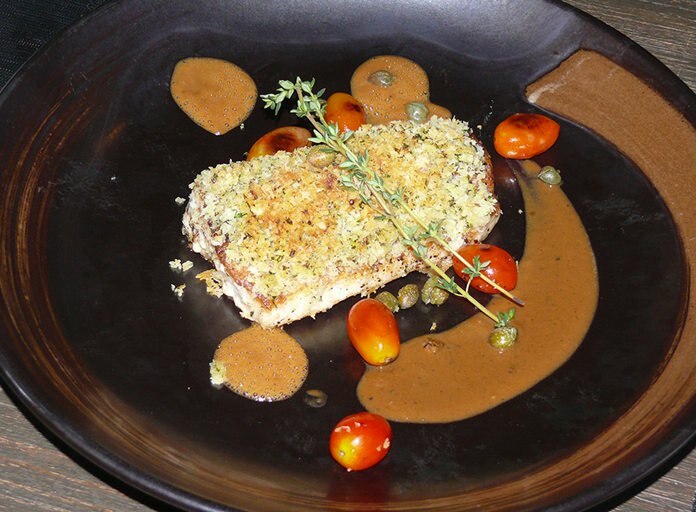 The herb crusted Sea Bass. The Dining Out reviewers were all in agreement that Mövenpick Na Jomtien presented five star cuisine with fresh ingredients and impeccable presentation. The talented chefs in France knew how to pass on the intellectual property and we diners are enriched by this. It should also be known that the cutlery and crockery were also of high quality. Please note that since this is a hotel the prices quoted need + + added. If you want to experience this type of cuisine you will need to get to Mövenpick before November 20. Believe me, it is worthwhile. Mövenpick Siam Hotel Na Jomtien Pattaya, 55 Moo 2, Sukhumvit Rd Km156.5 Na Jomtien, telephone +66 33 078 888, email [email protected] , www.movenpick.com/pattaya. Yupins – The Mouse that Roared!